Website builders are tools to create websites without the need for programming. They typically provide hosting and a simple interface to design your site. To find 2018’s best website builder, we compared the six top platforms, ranging from simple drag-and-drop builders, like Weebly, Squarespace and Wix, to more robust e-commerce and interactive systems, like WordPress, Shopify and Joomla. Choosing the right website builder is a vital first step to creating a business website. Each has its unique strengths and limitations, making them ideal for different kinds of websites. With the right platform, web design can go from a full day to a one-hour process, not to mention you’ll be much happier with the results. Based on the above criteria, we believe that Weebly is the best overall option. 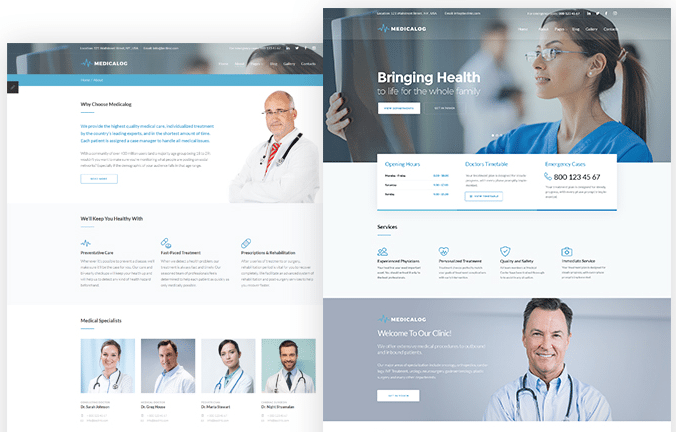 Weebly strikes the perfect balance between price, ease of use, and professional features, including its attractive modern website templates and strong technical stats like server speed and uptime. Weebly is the safest bet if you want a professional website but don’t want to get in over your head. It’s arguably the easiest of all web builders, breaking down the complex task of web design into something as simple as designing a PowerPoint presentation. Weebly offers a good selection of professional business templates that you customize with their simple editor, clicking on the screen to replace text and photos with your own content. Weebly is also capable of supporting more advanced features, like web forms, blogging and e-commerce, if you wish to venture there. In addition to the above features, all Weebly websites include 25 free themes ranging from restaurant, fashion, photography, business, and more. There are also around 300 apps to expand your website with additional features and content. Most website builders cost $12-$20/month for a professional website. The fact that Weebly does this for just $8/month AND includes e-commerce is impressive. It is second only to WordPress in terms of price, but is a lot easier to use and faster to set up. Creating a Weebly website is a simple, two-step process. Start by choosing a template that best matches your business. Then customize the template by replacing the stock photos and text with your own content. Or add entirely new features, like contact forms, buttons or videos, by dragging and dropping them from the left. Weebly Site Editor: Simply click to edit text and photos. Drag and drop new elements from the menu on the left. Weebly automatically creates several pages you might need, depending on your theme. For example, restaurant websites will come with Home, Menu, About, and Contact pages. Of course, you have the option to edit these as much as you like, or even create new pages altogether. Likewise, Weebly’s custom CSS editor and app center allow you to go much further, making custom formatting adjustments or adding interactive features like a social media feed or appointment calendar. But what’s great about Weebly is that you can always stick with the simple route. The advanced features are a bonus for those with a little more experience or time on their hands. Despite its lower price, Weebly websites tended to be faster and more reliable than the other website builders. Weebly websites took 1.6 seconds to load compared with an average of 2.9 seconds across all website builders. This results in a better user experience, as visitors aren’t kept waiting or deterred by a blank screen. It’s also one of the factors that Google uses to rank websites, so a fast website is crucial for good SEO. Weebly websites are up and running 99.97 percent of the time, which translates to roughly 13 minutes of downtime per month. This is above average, considering many popular websites are down as much as 30-60 minutes per month. Weebly has email and live chat support available to all users, available Monday – Friday, 9 a.m. – 9 p.m. EST, and Saturday/Sunday from 11 a.m. – 8 p.m. EST. They also have phone support available to Pro users ($12/month) and higher. Weebly is not ideal for larger websites, like e-commerce stores with lots of products or blogs that publish multiple articles daily. WordPress is typically better for this since you get more control over how your content is displayed. For example, you could build a custom WordPress theme that displays your top products sorted by category, color, size, or whatever you envision. With Weebly, you’re limited to only a handful of organizational styles, and have less control over page SEO. To get started with a Weebly website, click the button below to sign up for a free account. Then, follow along with our Weebly setup guide to start building your website. If you want visitors to interact with your website, such as by booking appointments, placing food orders, or tracking purchases, WordPress has the most possibilities. WordPress has been around a long time and has cultivated a huge community of developers constantly inventing new features. It’s the most flexible system, along with Joomla, that can be used to build just about any kind of website. One of the downsides to WordPress is that it can be less user-friendly. 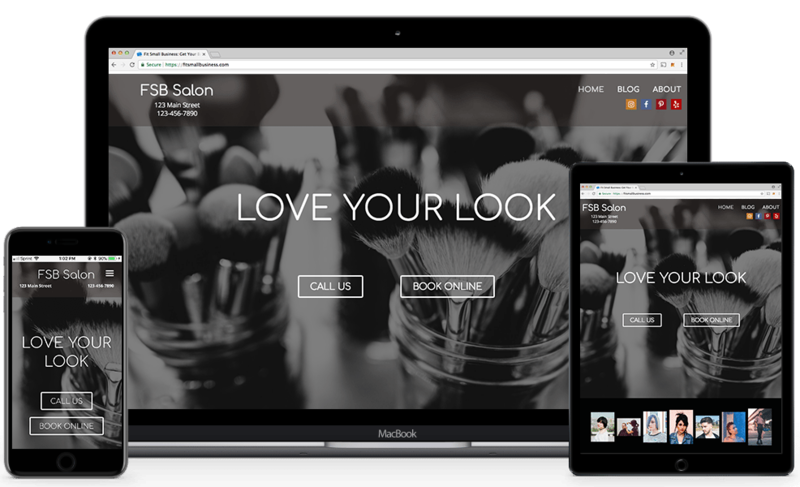 However, we’ve created three free WordPress themes that simplify the process, including a business theme, restaurant theme and salon theme (pictured above). This gives you the best of both worlds: It’s simple and inexpensive, but can also support a lot of advanced features if you need them. In addition to the above features, there are over 5,000 free WordPress themes to choose from, and over 40,000 free and paid plug-ins. WordPress is different from the other website builders in that the platform is free to use. 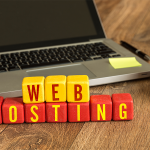 You just need to pay for hosting, and this tends to be a lot less expensive than a website builder. For example, through Bluehost, you get everything you need to create a WordPress website for just $2.95/month for the first three years (then $7.99/month). We recommend Bluehost for WordPress hosting not only because they’re the best priced, but they give you the most for your money. You get a complete version of WordPress with full access to themes and plug-ins, a free .com domain for one year and professional email accounts. Bluehost also fares well on the technical side with fast load times. 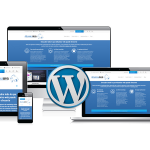 Designing a WordPress website is 90 percent about choosing the right theme and plug-ins. There are thousands of free and paid WordPress themes out there, representing just about every industry and use case imaginable. Furthermore, plug-ins allow you to add or integrate just about any feature—from CRMs to appointment booking programs, real estate systems and more. Once you’ve chosen a theme, the design process is fairly simple. On the “customization” menu, enter your information and settings in the left menu, and WordPress will automatically update to the right. The process is not quite as hands-on as Weebly, Squarespace or Wix’s drag-and-drop editing. However, having fewer options to mess with does make editing on WordPress more straightforward. At Fit Small Business, we created three free WordPress themes specifically for small business owners. We wanted to combine the cost-savings and scalability of WordPress with the simplicity of DIY site builders like Weebly. Click to see examples of our business theme, restaurant theme and salon theme. WordPress speed and performance will vary depending on the host. We tested WordPress sites hosted on Bluehost, and the results were strong. Pages took an average 1.7 seconds to load compared with an overall average of 2.9 seconds. That made WordPress second only to Weebly in terms of speed. Again, because WordPress is a free, open source platform, customer support will come from your host provider. Bluehost has 24/7 phone and chat support, and is able to answer both WordPress and hosting-related questions. With WordPress, you’ll also find a huge support community, including forums and free tutorials. For example, we have detailed support guides for all our Fit Web Themes WordPress themes, and provide one-on-one support via our Q&A forum. Most themes and plug-ins will provide free resources like these. The main downside to WordPress is that it’s complicated. There’s the fact that you need to set up hosting separately, choose from thousands of available themes, and deal with the WordPress editor, which is not drag-and-drop like Weebly or Squarespace. On the other hand, if you head into WordPress knowing which theme you want to use, and use a host like Bluehost (which includes WordPress pre-installed), you can largely mitigate these downsides. We created a simple route for our readers to get started with WordPress. First off, click the button below to sign up for Bluehost, which includes WordPress pre-installed. Next, check out our three free themes designed by us at Fit Small Business specifically for small business owners: Business Edition, Restaurant Edition and Salon Edition. You’ll find it’s a quick and painless way to create a slick, modern business website. 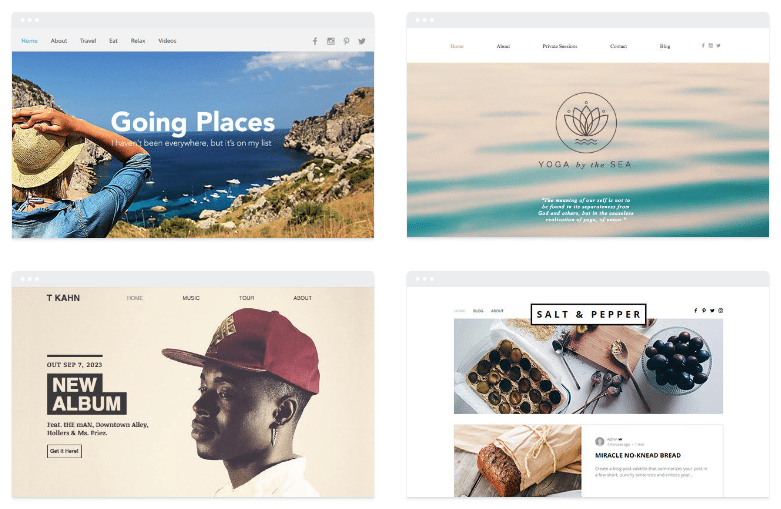 Squarespace is an easy-to-use website builder, in the vein of Weebly, but with an extra level of elegance. 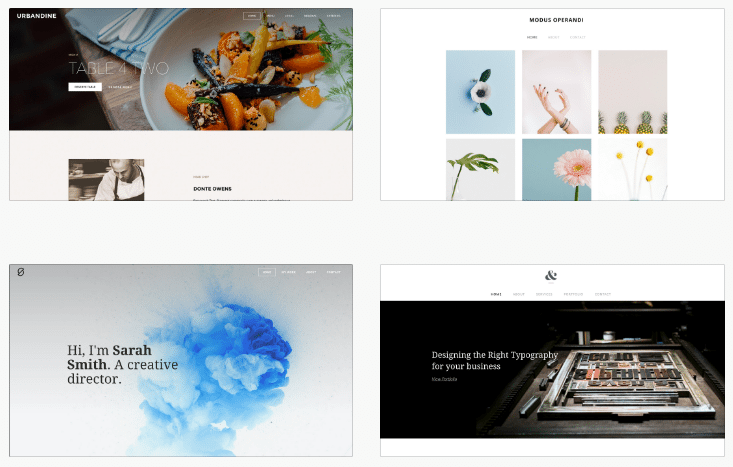 Squarespace templates are minimal, making great use of open spaces to showcase a portfolio. Squarespace also supports official integrations with restaurant platforms ChowNow and OpenTable, so it works especially well for restaurants that prefer the minimalist style. In addition to the above features, there are over 90 free template to choose from and about 100 official integrations. Squarespace is a little more expensive than Weebly and WordPress, starting at $12/month for a professional website. This grows to $18/month for an e-commerce website plus a three percent transaction fee on all items sold. The Basic and Advanced Store editions remove this fee, however, and add more advanced e-commerce features. Squarespace stands next to Weebly as one of the easiest website builders to use. Designing your site is a visual process—you drag and drop elements like text boxes, shapes and photos to craft your pages. All features and settings are adjusted from the same Squarespace menu. You don’t have to juggle multiple menus or install plug-ins as you do with WordPress. 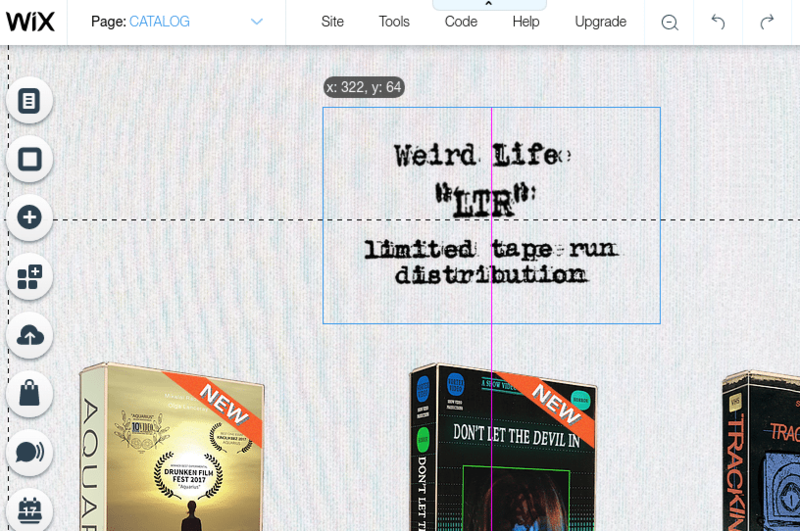 Editing is somewhat limited compared with a true drag-and-drop editor like Wix. Elements need to be placed in predefined areas, with “spacers” being used to add empty space. On the plus side, this keeps your code clean and allows your website to load faster. Also, like Weebly and WordPress, Squarespace does allow you to add custom CSS, so there is the option to make more substantial edits should you need it. Squarespace websites perform OK compared with the other website builders. Web pages took an average of 2.4 seconds to load during our test, compared with only 1.6 seconds for Weebly, but 3.9 seconds for Wix. Considering the higher price you pay for Squarespace, I would’ve liked to see better server performance, but 2.4 seconds is still above average. Squarespace has 24/7 email support and live chat available weekdays, 4 a.m. – 8 p.m. EST. Although phone support isn’t available, the customer service team has earned a five-star rating from users, notably offering fast and attentive responses. The main downside to Squarespace is the higher price tag. An e-commerce website costs at least $216 per year, and that includes a three percent fee on your sales. A WordPress e-commerce site can cost as little as $36 per year, and they won’t keep a percentage of your sales. Or, if you prefer the simplicity of a drag-and-drop website builder, you can pay half as much for Weebly. Shopify is great if you sell products in a physical store and want to sell online. It provides both a POS system for in-store sales and an e-commerce website builder for online sales. Combining two in one keeps your inventory and sales reports aligned and makes things easier for customers, since they can use gift cards or return items across both mediums. Credit Card Processing Rate 2.8% + 30? 2.6% + 30? 2.4% + 30? In addition to the above features, all plan include 10 free templates and over 1,500 free and premium Shopify apps. Also note: The above rates are for Shopify websites only. The in-store point-of-sale (POS) system costs an additional $49/month. Shopify requires a bigger investment, but it can save you in the long-run if you make a lot of sales. Most website builders require Stripe for credit card processing, which charges 2.9% + 30¢ for online transactions. Shopify has their own credit card processing service, charging only 2.6% + 30¢ with the standard package. At $500,000 per year in online sales, this would save you $1,500—easily covering the price of Shopify’s standard package. 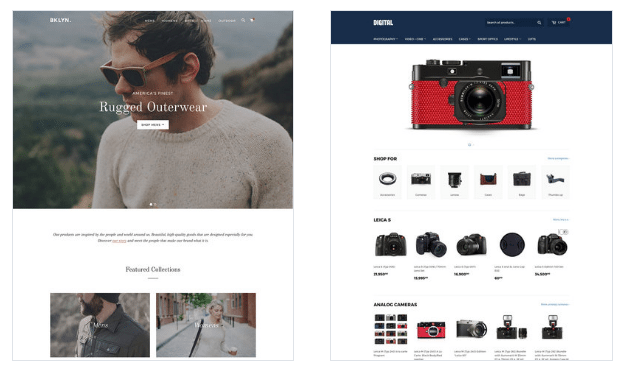 Shopify puts e-commerce at the center of their website builder, surrendering some design controls for the sake of a simpler and more robust e-commerce interface. Users start by picking one of 60 free and paid themes. From there, you’ll add or import your products, with the option to get assistance from Shopify’s onboarding team. Lastly, you’ll set up the layout of your store and create any non-store pages, like your “about” page or even a blog. Shopify gives you a lot of control over the categorization and display of your products, including a convenient “related products” widget that appears on item pages. On the other hand, page layouts tend to be hard-coded. If you want to edit the checkout layout, for example, to add extra product information, you may need to do this using custom CSS code. Shopify websites perform good compared with the other website builders. Web pages took an average of 2.0 seconds to load during our test, which is slightly longer than the 1.6 seconds for Weebly sites, but better than the average load speed of 2.9 seconds. Shopify also has the best uptime of any web builder we reviewed. Websites are up 99.99 percent of the time—that means you’ll experience less than five minutes of downtime in a given month. By comparison, Weebly and WordPress websites are down for roughly 13 minutes. Shopify has 24/7 phone, chat and email support, making it one of the most accessible web builders for customer support. Shopify has earned a four-star rating from users, with many users rating customer service highly. Unless e-commerce is your main focus, Shopify is not intended to be a full replacement for your business website. While it is possible to create a simple homepage, blog, and other features like calendars and webforms using Shopify apps, you do not get nearly as much control of these elements as you would with a “true” website builder. To get started with Shopify, follow the link below to sign up for a free, 14-day trial. You can also follow our guide where we show you how to set up Shopify using our own drop shipping store as an example. Wix is a fully open canvas. 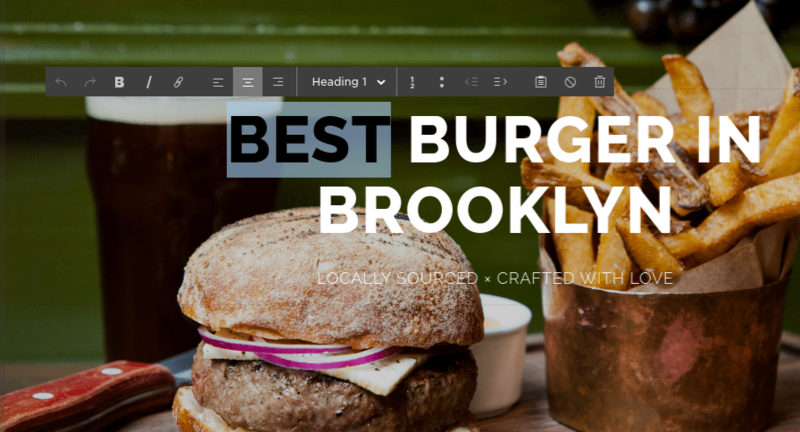 It features a simple drag-and-drop editor like Weebly and Squarespace, but unlike the other systems, there’s no restrictions on where you can place elements. This will please the creative designer who wants to achieve a specific vision without the need for programming. However, the freedom does come with its downsides: in particular, slower loading times and a higher price tag. Wix also has a $5 starter edition, which allows you to connect a custom domain but requires you to display Wix ads, and a $25 VIP edition, which provides priority customer support. All plans include over 500 free Wix templates and over 200 free and paid apps. Most businesses will need to use the Unlimited edition for $14/month, or the e-Commerce edition if you want to sell any products. The Combo edition limits you to 2GB of bandwidth, which means only 1,000 clicks per month, or even fewer if you have a lot of high resolution photos. The Unlimited edition, as the name implies, gives you unlimited bandwidth. 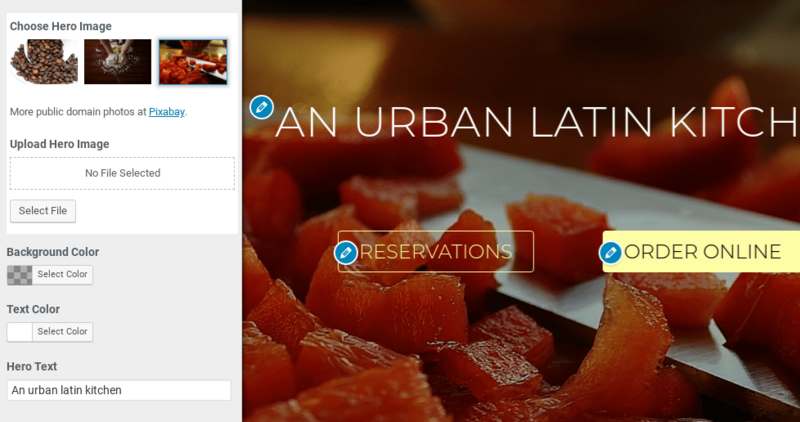 Similar to building a PowerPoint slide, Wix lets you can drag text, photos, shapes and widgets anywhere onto the page. 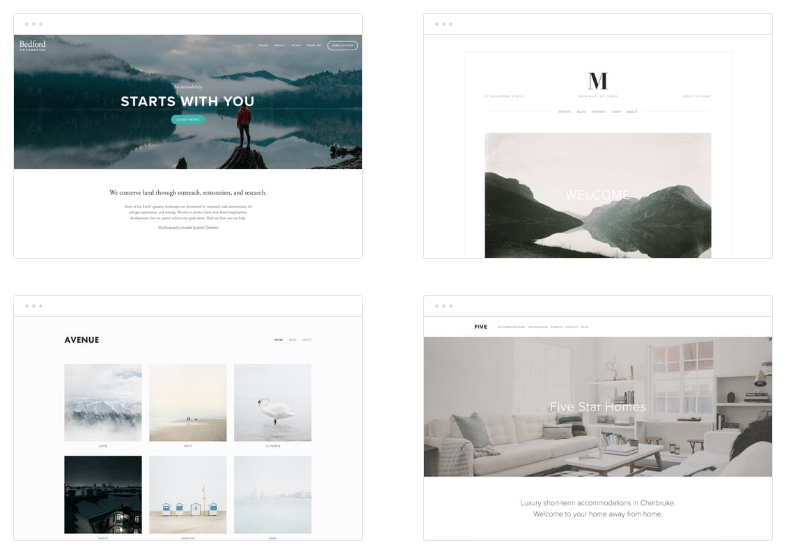 While Weebly and Squarespace have similar graphical editors, both limit your editing to preset areas in an effort to reduce the amount of coding behind your website. The Wix Editor: Elements like photos can be placed anywhere on your web page. The unrestricted freedom makes Wix a bit easier to use and gives you a lot more possibilities. You can change the font style from one paragraph to the next and move elements right up against the margin of your website. You can even edit the mobile version of your website separately from the desktop or tablet versions. On the other hand, Wix gets tedious when you have a lot of photos or text boxes, and they all need to be properly sized and positioned. It’s all too easy to place things a few pixels off by accident. The looser structure also makes Wix websites more complicated on the backend, and thus they take longer to load. Wix websites run slower compared with the other website builders. Web pages took an average of 5.2 seconds to load during our test, compared with only 1.6 seconds for Weebly sites and 1.7 for WordPress. This seems to be because of Wix’s custom editor, which results in messier programming code. Wix websites also go offline more frequently than the other website builders. An uptime of 99.95 percent means websites are down roughly 22 minutes in a given month. By comparison, Weebly and WordPress websites are down for roughly 13 minutes, and Shopify only five minutes. Wix has email and phone support available weekdays 8 a.m. – 8 p.m. EST. While waiting times on the phone can be somewhat long, they allow you to request a callback, freeing up the time you’d normally spend on hold. Wix has a four-star rating from users, with customer service typically well regarded. The main downside to Wix is the high price you’ll pay for a website that doesn’t run as quickly or as reliably as competitors. Furthermore, it lacks a custom CSS code editor, which all the other website builders offer as a way to override the default settings. Like WordPress, Joomla is an open source content management platform that’s freely available to users. Unlike WordPress, Joomla is a bit less user-friendly, and geared more towards web design pros. It’s especially useful for creating advanced, social websites, where users can log-in and interact with your content. In addition to the above features, all Joomla hosting plans gives you access to over 8,000 free and paid extensions. Just like WordPress, you can get Joomla hosting from many different services. We recommend using Bluehost since they provide unlimited bandwidth for a low cost, and provide bonus features like business email accounts, and a free .com domain for one year. Joomla is technically not a website builder. Like WordPress, it’s a content management system, which was the most common tool for designing business websites before graphical website builders came out in the last several years. While WordPress has managed to evolve with the times and adopt many user-friendly features, Joomla has stayed largely the same. For example, there is no graphical menu for editing your template or designing your homepage. Instead, you’ll need to use a text-based menu to change fonts and colors, or edit the PHP code directly. Despite its difficulty, Joomla remains popular with a subset of small businesses because of features like their login module. You can allow visitors to register an account, then login to access additional pages or interact with a community forum. While WordPress and other website builders support this by way of plug-ins or upgrades, Joomla is the only platform I’m aware of that includes it by default. As a result, it can be integrated more naturally into your website. Just like with WordPress, Joomla speed and performance will vary depending on the host you choose. We tested Joomla using Bluehost, and found a fast page load time of 1.7 seconds compared with an overall average of 2.9 seconds. Because Joomla is a free, open source platform, customer support will come from your host provider. With Bluehost, you’ll get 24/7 phone and chat support. You can also find support documents on Joomla’s official support wiki. Make no mistake: Joomla is not for beginners. It’s nothing like Weebly, Squarespace or Wix, which have opened up web design for beginners. Even WordPress is significantly easier to use, thanks to their graphical theme editor and simpler publishing interface. Page load speed tells us how long it takes a website to load. It’s an important metric for businesses, since slow-loading websites will decrease user engagement. For the test, we found three websites built on each platform. This included both a simple informational website as well as a more complex e-commerce store and blogs, in order to get the full range of potential sites. From there, we tested each site on WebPageTest.org using a Chrome desktop browser with a 5 Mbps cable connection. Bear in mind, this is a little slower than average in the United States, so for most users, the actual speed will be a bit faster. See full list of website builder software reviews. Above all else, choosing the right website builder will save you time, effort and money on your project. While most website builders are flexible enough to accommodate different industries and use cases, getting the choice right from the start will simplify things dramatically. It can go from a complex, multi-day project, to a simple one-hour job. For most small businesses, our recommendation is to use Weebly, or WordPress with our simple business themes. Both of these are economical, simple and reliable routes, offering strong server performance and a good range of features should you need to update.